Atlantic Lodge in Ireland South a perfect base for your holiday in County Cork. Find out more about Atlantic Lodge below. This detached cottage is located in the small hamlet of Kilcatherine, near to Eyeries in County Cork and can sleep seven people in four bedrooms. Atlantic Lodge is a block built, detached cottage in the rural hamlet of Kilcatherine overlooking the Atlantic Ocean, just four miles from Eyeries in County Cork. With one single bedroom, one twin (with ensuite facilities) and two double rooms (both with ensuites), this cottage can sleep seven people. The accommodation also includes a family bathroom, a fitted kitchen with a dining area and a sitting room with an electric fire. To the outside of the cottage is a lawned garden and off road parking for four cars. With stunning ocean and mountain views and a direct path from the garden to the sea, Atlantic Lodge is the ideal cottage for anyone who longs for the smell and the sounds of the ocean on their holiday. Oil central heating with electric fire in sitting room. Electric oven and hob, microwave, fridge, washing machine, tumble dryer, dishwasher, TV, DVD, CD/radio. All fuel and power inc. in rent. Bed linen and towels inc. in rent. Cot, highchair and stairgate available. Off road parking for 4 cars. Enclosed lawned garden to the side and front. Sorry, no pets and no smoking. Shop and pub 4 miles. Atlantic Lodge is a great base to explore the wonders of County Cork and you will find plenty of activities near by. Atlantic Lodge is at Eyeries, County Cork. Check out the map below for directions, use the controls to zoom in. Find Cottage Holidays works closely with independent cottage owners and leading holiday travel operators to provide you the widest choice of self catering accommodation across Ireland. 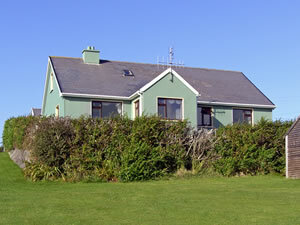 Atlantic Lodge in County Cork is available through: Sykes Cottages.